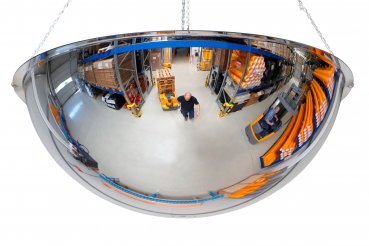 The BM 360 ° Dome Mirror is an efficient and space-saving investment in occupational safety. The BM 360 ° has a brilliant mirror image and can therefore be used in industrial areas as well as in workshops and department stores. 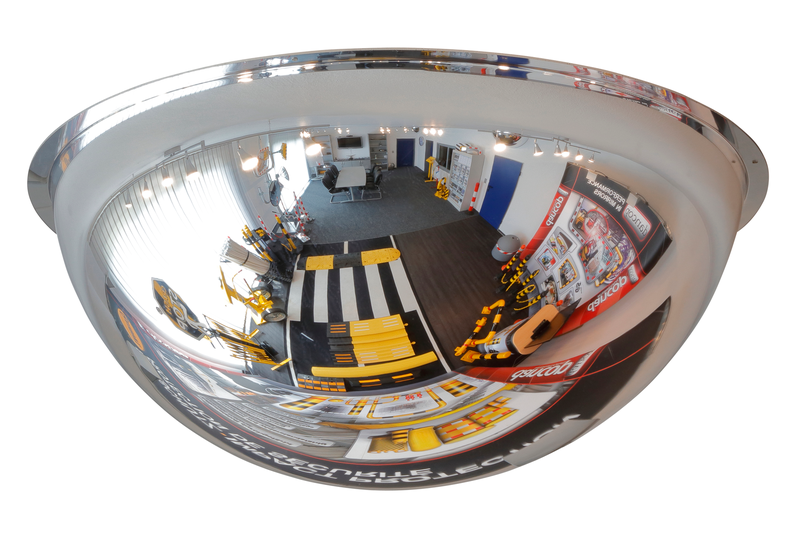 In the industrial sector, the dome mirror 360 ° provides a good overview and secures crossings optimally. The BM 360 ° dome mirror is made of lightweight and impact-resistant acrylic (70% stronger than glass) or indestructible polycarbonate and has a low weight and a long service life. Due to its material (polycarbonate), the mirror can also be used without problems in the food industry. The mirror can either be screwed directly to the wall / ceiling (holes in the edge of the mirror are pre-drilled) or suspended from the ceiling by means of chains (chain set sold separately).